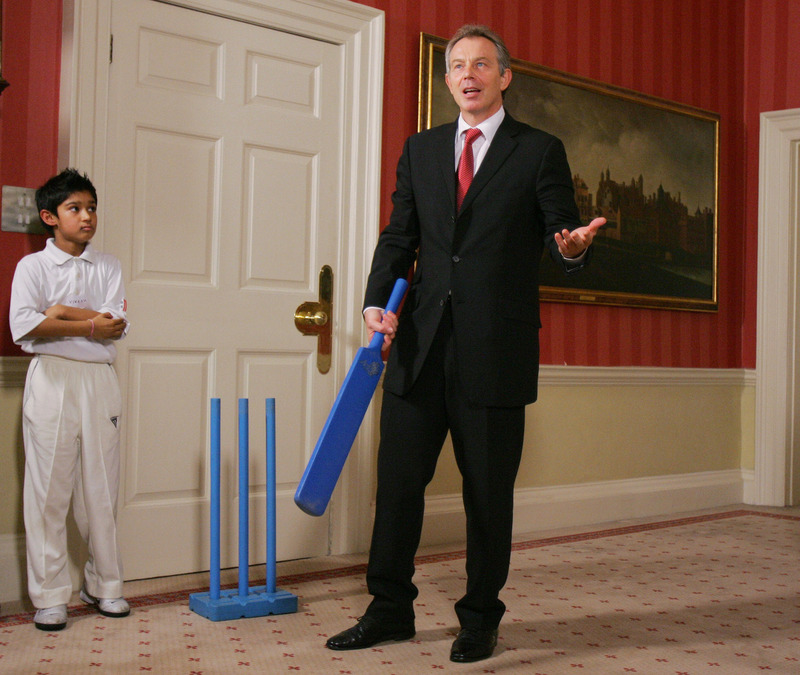 As a boy Andrew Redfern caused a mini political scandal with his letter to a government minister – http://www.takingthefield.com/stories/scandal-started-youth-cricket. The relationship between politics and cricket goes back along way, despite the desire of some to separate politics and sport. Both are important parts of life stiring strong emotions so this ‘ideal’ rarely exists. Possibly the most famous incident of cricket and politics colliding was during the D’Olivera affair. ‘Non-white’ cricketer Basil D’Oliveira was not selected for the test side due to tour South Africa 1968-69, despite having scored 158 not out against the Australians just a few days before the selection meeting. The selection committee maintained that their decision was purely based on cricketing considerations including an assertion that D’Olivera’s style would not suit the South African conditions, but many suspected that the decision had more to do with ‘not rocking the boat’. Under South African laws D’Olivera would not have been permitted to play on a South African tour. In 1970 cricket was debated extensively in the House of Commons and the House of Lords. 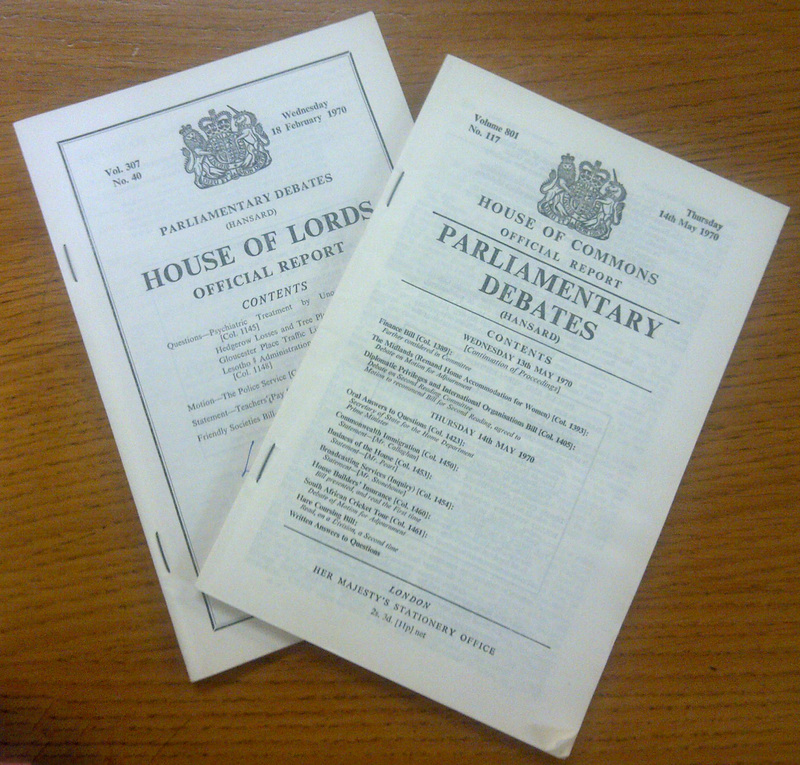 A full account of the debates can be found in Hansard, these copies are from the MCC Archive. The South African’s were due to tour England the following year, but the ‘Stop the Seventy Tour’ campaign was launched with protests and threats of direct action and the tour was eventually cancelled after a direct appeal to the Cricket Council from the Home Secretary James Callaghan. This was not the first time politicians became involved in the game. During the bodyline scandal the friendly relations existing between England and Australia were under threat as a sporting tactic transformed into a near diplomatic incident! During the furious exchange of telegrams between the two cricket boards the press and politicians such as the Governor of South Australia Sir Alexander Hore-Ruthven and Stanley Baldwin also became invovled and it was alledge that there were formal discussions in the cabinet by both nations. Why bodyline became so political is a murky issue, many members of the MCC committee had strong links to the Conservative Party which may have had some effect, also for some Australian nationalists the tactic was symbolic of English imperialistic and authoritarian attitudes. 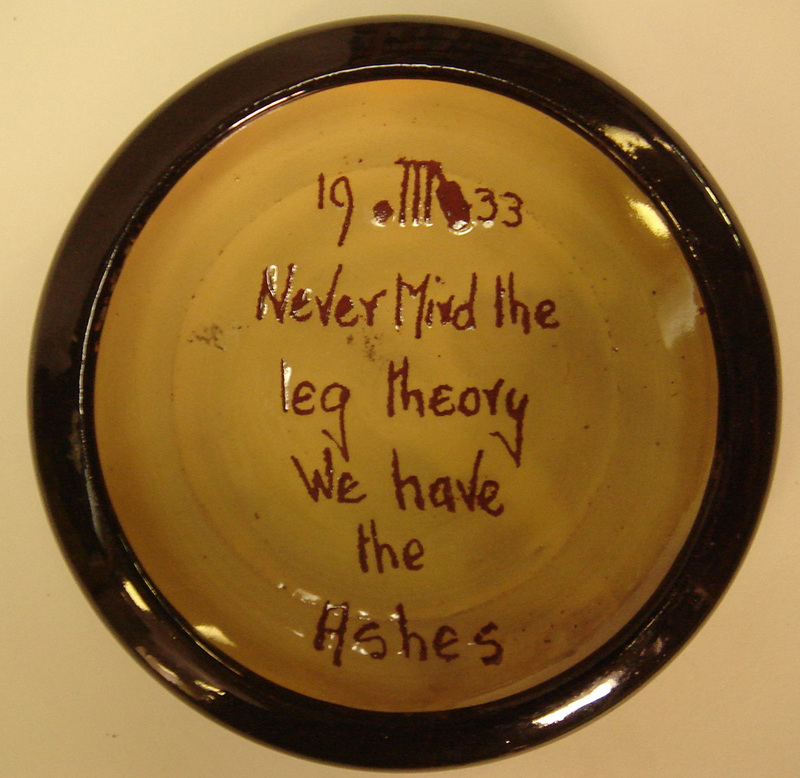 A rather glib little momento of the ‘Bodyline’ series from the MCC Museum. The series came close to upseting relations between two countries. As in Andrew Redfern’s youth, the issue of cricket in state schools is still seen as a political issue today, especially as we live in a time when fewer players from working class origins reach the top than probably in any time of the cricket’s history (see previous post – Is cricket Posh?). Many state schools do not have the space or facilities to provide cricket, and the problem was exacerbated by the sale of playing fields in the 1980s and 90s. So whether it’s race, class or international relations cricket has often proved a political hot potato. 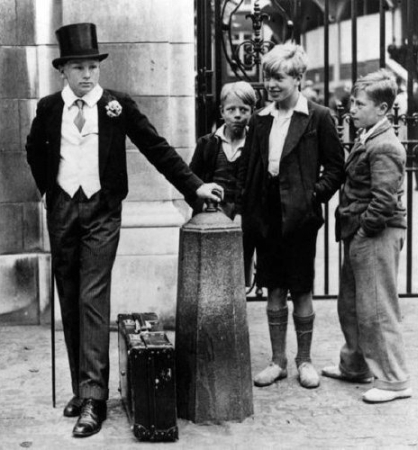 Eton schoolboy cricketer waiting to go into Lord’s being marvelled at by some local boys. In my latest TTF story Barry Dennis tells us about a joke suggesting that his cricket team, Wimbledon CC, is rather posh (http://www.takingthefield.com/stories/joining-yahs). But is cricket in general posh? Growing up I always thought so. We didn’t play cricket at my school, it was something that was played at posh schools or by the posh boys in Enid Blyton books. Having visited a couple of cricket clubs now I realise not all cricketers are posh, some of the people I’ve met have been very common (ha ha only joking), but they have been what I regard as normal. So where does the posh image come from? Does it depend on whether or not your school teaches cricket? Is there a north/south divide? Is it because cricket spectators seem so much better behaved than those at the football (even though attending football is much more expensive)? Is it down to the appearance of those immaculate cricket whites? I would be genuinely interested to hear your views. Although I admit my childhood impression was not entirely correct – I think it had some basis in reality. For example, 7 out of 11 of the England test team who played in the last test were privately educated, that’s pretty high when you consider only 7% of the population attend private schools. So is there something ‘posh’ about cricket?